Celebrating Valentine’s Day very different experience if you’ve been married to your sweetie for years rather than just dating. The trick is to shape the Valentine Experience to your partner. Many of the gifts of flowers that men give to women are a form of apology – one that conveniently dodges the difficulty of specifying exactly what it was you said or did that created the need to apologize. Come to think of it, the same is true about flowers given simply out of love: They brush aside the need to talk about your feelings – something most men find difficult. Then there is the problem of the choice of flowers. After a series of grocery store bouquets, Kim let me know that she loves white roses. In my innocence, I did not take this as a criticism of my taste. She was always sincerely grateful. She liked to display them after they turned brown, which meant I could buy them on sale, speeding up the process. She always appeared pleased whatever flowers I brought home, but I eventually learned that in this area, as in many others, I need strict guidance. 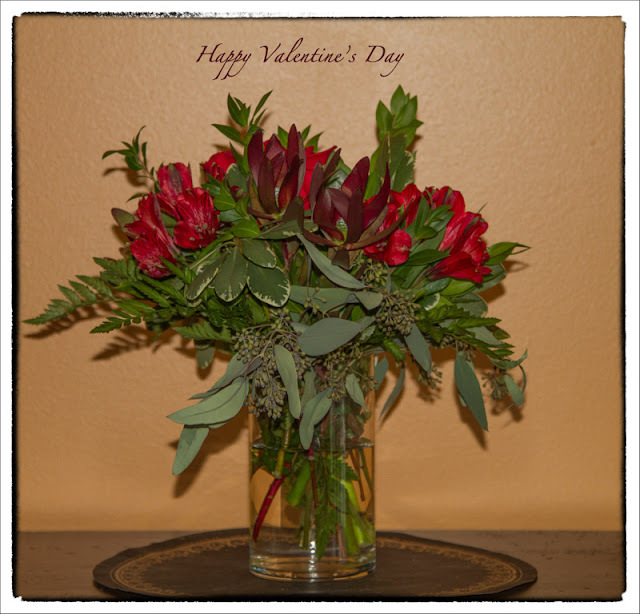 So a few days before Valentine’s Day I detoured to the florist downstairs from our condo. “O.K. I didn’t quite understand how it worked.” It’s important to understand how your relationship works. Kim has a knack for doing things her own way – including writing this sentence. Kim hinted that she would like, as a gift, a box of Sees Chocolates – not the usual Nuts and Chews that we get, but something in a cool box like the gold one on page 9. The candy surprise arrived a week before Valentine’s Day (saving me $12 on shipping by avoiding the target date). Our goal is to make it last for a week. To help this happen, Kim hid the box – from herself. You can do things like that when you get old. But when you get high you sometimes forget to hide the box. Kim made me a chocolate torte for Valentine's Day this year. It works. The onion soup she made also works, even without the drug effect. Lately this has taken the form of rubbing and pressing the muscle spasms out of Kim’s back. If I work it right, I can do this while hugging. The Danish concept of hygge (pronounced “hoo-ga”) (thanks, Angie, for the book recommendation – The Little Book of Hygge) includes feelings of comfort, togetherness and well-being. An important component of hygge, in addition to wine and cake, involves candlelight. Kim has been practicing hygge for years. We do not celebrate Valentine’s Day with special candlelight because we use candles at most of our dinners. We do this to celebrate. We also do it because we have too many candles and need the drawer and cabinet space for storage. We have a bottle of Champagne in the refrigerator. It’s been there since a week before New Year’s Eve. We haven’t opened it yet because we would fall asleep before we finished it, and we don’t want to waste it. We probably won't drink it on Valentine’s Day. We may drink it on the Fourth of July. I write a Valentine poem for Kim every year. I won’t be sharing this year’s poem in this blog because a) it’s private and personal, and b) it has moving parts. “But I’m not a poet,” I can hear you protest. Not true. You can be a poet, though you may not be any good at it. Doesn’t matter! Write something, even if it’s lame. A lame effort might have a charm of its own. People are very moved when watching the Special Olympics, so think of it as a similar event for poetry. Or you can find one that someone else wrote and, without plagiarizing, claim that it sums up the way you feel. Hallmark cards can do that for you, but it’s better, at least, to take the trouble to find one for yourself. The point, to repeat, is to figure out what works for your relationship and to design your Valentine accordingly. If you have ideas or stories about Valentine's Day celebrations, past or present, please share them at dstring@ix.netcom.com.